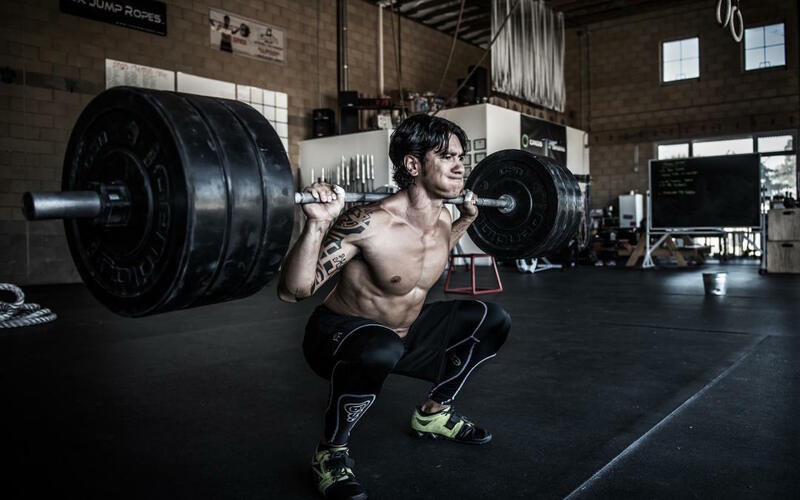 To this day, we still hear certain squat rules echoed over and over throughout gyms and health clubs by many fitness professionals that often sound contradictory. While some rules emerged through research, the origins of others may lie in folklore and myth. The squat is one such example where we hear an endless list of cues: keep the knees behind the toes, align your knees over your second toe, open your stance, keep your head up, and many more. Which do we trust as evidence-based and which present as more myth than fact? Furthermore, when we watch a fitness professional squat, we oftentimes notice that many are incapable of squatting correctly on account of inadequate levels of mobility or stability throughout their kinetic chain (e.g., ankle mobility), they fail to follow their own rules and resort to compensated movement (dyskinesis), or need to update their knowledge and understanding of proper form given some updated research on human movement. Fry and colleagues examined squats where the knees moved or were restricted from moving forward. As expected, when forward knee movement was restricted, the shear forces and torques at the knee were reduced. Shear forces at the knee involve anterior-posterior movement of bones at joint and affects cruciate ligaments most notably. The anterior cruciate ligaments (ACL) begin to experience anterior shear forces starting at a 15° knee bend, experiences greatest anterior shear forces at a 30° knee bend, and then diminishes after a 60° knee bend. The posterior cruciate ligaments (PCL) begin to experiences posterior shear forces at a 30° knee bend, experiences greatest posterior shear forces at a 60° knee bend, and then diminishes after a 90° knee bend. Squatting beyond that depth increases compressive forces within the knee as the passive structures around the joint assume much of these forces, which unloads the cruciate ligaments in most people while also potentially decreasing compression forces on the menisci and articular cartilage in the joint. However, the researchers also noticed greater amounts of shear forces and torque at the hips versus the knee when squatting without allowing the knees to move forward – the ramifications here are more serious given the fact that the lumbar spine is more susceptible to injury. In other words, more forward leaning at the hips because of forward knee restriction generates greater shear forces between the individual vertebrae in the spine (e.g., L5-S1, L5-L4, L4-L3, etc.). In other words, during the upward phase, more spinal extension is needed and this may be exacerbated by a head-up position. Keep in mind that for every 2° of extension of the spine from neutral, the compressive forces on the posterior annulus (the portion of the disc that resists pressure during compression) of each disc increases by an average of 16%. Helps initiate an isometric contraction within hamstrings that help unload the ACL. The knee only begins to translate forward at about 15 – 30° of hip flexion, creating more of a hinge joint at the knee which may reduce potential shear forces. Be sure not to confuse slight foot eversion of 8-10° in standing position with neutral talocalcaneal position with eversion and pronation. Normal foot position is generally considered to be feet parallel to 8-10° of eversion. A wide squat-stance is one where the feet are generally placed between 150 – 200 % of shoulder width. Deep squats are popular given how they, coupled with a low bar rack position, can effectively target the gluteus maximus, adductors and hamstrings. Outward rotation of the legs and feet often accompany the deep squat and is generally acceptable if the rotation occurs within the hip joint (i.e., femoral head), and not at the knee. Furthermore, excessive external femoral rotation (i.e., beyond 30 – 40°) might also change hip position – to accommodate external rotation of the femur, the pelvis tilts anteriorly which changes lumbar spine alignment and may even alter the body’s center of mass leading to a loss of stability. Just stand and externally rotate your thighs and notice the tension build up in your low back. As mentioned previously, when un-racking the bar, the pelvis shifts naturally into a posterior tilt, forcing some anterior pelvic tilting due to leg position simply translates to more forces within the hip and lumbar spine. By contrast, a narrow squat-stance is generally considered to be one where the feet are no wider than 120 % of shoulder width apart. This position, coupled with higher bar rack positon, loads more into the anterior muscles. This position also increases the potential for more forward knee movement. The head-up positon is probably a bad myth propagated in gyms. On one side, a head down position by as little as 4½° from neutral increases spinal flexibility, which in turn increases posterior spinal compression. Furthermore, it can diminish balance. By contrast, a head up position is believed to help maintain balance and shift weight into the heels. More often than not, this is usually a consequence of inadequate hip flexor and/or ankle mobility that creates the forward trunk lean and necessitates a head-up position. As mentioned previously, this positon extends the thoracic spine and compressive forces along the entire spine. Proper cueing is the maintenance of a rigid spine that is either neutral or slightly flattened. This can be easily cued with a dowel keeping constant contact with the sacrum, thoracic spine and back of the head throughout the movement. A slightly flattened spine is quite normal during squatting, especially with increased loads. As the bar is placed behind the line of gravity of the body, once un-racked the hips will naturally move forward (posterior tilt) to maintain center of gravity – this flattens the lumbar spine slightly. Allow the tibia to translate forward, reposition the spine to be parallel with the tibia and the head will fall into a more neutral position. Engaging your core and abdominal musculature during the squat can help prevent lumbar hyperextension that is so frequently observed. This muscle engagement can result in greater muscle activation than witnessed during a plank exercise – yes, your squats do target your abdominal muscles as stabilizers. While some may argue that the squat is perhaps one of the most functional exercises we can do – that statement is not without controversy. While it does mimic a bend-and-lift movement, in life, that movement to pick up a box or child requires the hands to reach towards the floor and not be positioned with shoulder abduction and external rotation as in a back squat. Therefore, the traditional deadlift movement is the truly functional movement and should be taught first as a pre-requisite to the squat. Moving the arms into the back squat position requires thoracic extension that one may not have. The squat therefore, will compromise lumbar stability. Qualify your clients for the squat with a movement screen (i.e., moving the arms into the back squat position while observing lumbar stability) before teaching them the exercise. A movement should always precede an exercise. The depth of your squat should be dictated by a movement need (i.e., to get your fingers to the ground under a box) and not by an exercise (i.e., thighs parallel to the ground). Although many variation of the squat exist, some truths will always prevail – maintain your knee/foot alignment, ensure hinging and timing of forward knee translation, facilitate adequate ankle mobility to avoid dysfunction, maintain a rigid pelvis (sacrum, thoracic spine and head) and aim to achieve parallel alignment between your tibia and trunk. With proper form, the likelihood of a repetitive-type injury reduces and performance improves. Abelbeck KG, (2002). Biomechanical model and evaluation of a linear motion squat type exercise. Journal of Strength and Conditioning Research, 16:516-524. Caterisano A, Moss RF, Pellinger TK, Woodruff K, Lewis VC, Booth W, and Khadra T, (2002). The effect of back squat depth on the EMG activity of 4 superficial hip and thigh muscles. Journal of Strength and Conditioning Research; 16(3):428 – 432. Escamilla RF, (2001). Knee biomechanics of the dynamic squat exercise. Medicine and Science in Sports and Exercise, 33:127 – 141. Fry AC, Smith JC and Schilling BK, (2003). Effect of knee position on hip and knees torques during the barbell squat. Journal of Strength and Conditioning Research, 17:629-633. Kanamori A, Woo SL, Ma CB, Zeminski J, Rudy TW, Li G, and Livesay GA (2000). The forces in the anterior cruciate ligament and knee kinematics during a simulated pivot shift test: A human cadaveric study using robotic technology. Arthroscopy, 16(6):633 – 639. Li G, Rudy TW, Sakane M, Kanamori A, Ma CB, and Woo SL (1999). The importance of quadriceps and hamstring muscle loading on knee kinematics and in-situ forces in the ACL. Journal of Biomechanics, 32(4):395 – 400. Markolf KL, Slauterbeck JL, Armstrong KL, Shapiro MM, and Finerman GA (1996). Effects of combined knee loadings on posterior cruciate ligament force generation. Journal of Orthopaedic Research, 14(4):633 – 638. Sakane M, Fox RJ, Woo SL, Livesay GA, Li G, and Fu FH, (1997). In situ forces in the anterior cruciate ligament and its bundles in response to anterior tibial loads. Journal of Orthopaedic Research, 15(2):285 – 293.